It certainly feels that way. We’ve witnessed the (hyper-)reality of the new US president and Brexit deliberations trundle on to some kind of deal with the rest of the EU after the formal exit was announced. Some areas of the world (Yemen, Syria, Myanmar) continue to take a huge toll on working class lives and livelihoods through warfare and forced displacements, where we are still mostly disconnected from the horror abroad if not for the repeated calls for humanitarian aid, although the war has come home to England with terrorist attacks in both London and Manchester. The Trump administration has already attempted to reverse decades of sexual liberation and more social policies (such as healthcare) and action against climate change has been scuppered by a protectionist focus on fossil fuels. Immigration controls have been used to restrict freedom of movement into the US to follow up on the promised hard line against Muslims. Diplomacy has evaporated in relation to Korea and Israel. Regional nationalisms have taken hold in some parts of Europe, notably Spain with the Catalan independence drive, also apparent elsewhere such as in Corsica. In Britain, the Grenfell fire and its aftermath brought into grim and deadly relief the inequalities in British society with its still unabated increases in rent and house prices whilst the choice of insulating materials for social tower block housing sat in the hands of distant bureaucrats including, it appears, neglectful or incompetent building regulations officers, whilst the organised voice of tenants was ignored. The economy has flattened and interest rates went up for the first time in years, the Bank of England responding to increasing personal debt due to wage stagnation. In other words, austerity is permanent and normal, and growth just isn’t there to fix it. At the same time state services like the NHS hang in the balance having little room left for more efficiency savings whilst social inequality only piles on the pressure. On the otherhand, promise of advancement from entrepreneurship and philanthropy of the rich, especially those who hold the reins of the legacy of dotcom, has been lifted to dizzying heights and we are even asked to consider this a new Golden Age. Private capital *can* solve climate change and other global problems, especially with the use of the technology that created all this wealth in the first place. We’ll end poverty *and* go to Mars. No power to the people though who are now asked to worry about their more lowly jobs being done by robots. The number and knowledge about celebrity abuse cases has increased and wider discussion by survivors on social media about this and legal action taken has highlighted the continued ability of powerful men and institutions in Western society to do as they please. And the authoritarian Left is not excluded from this. Overall, the Left in Britain is expressing their own ‘yes we can’ confidence, as the leadership cult of Corbyn has been honed to an almost religious level after Labour’s General Election boost, but seems to sweep under the carpet the nastier aspects of British politics fostered by Brexit – xenophobia and fear of the other. Most of the effort is focussed on winning in the electoral process, next time, but it seems hard to get away from the fact that they are behind the curve in trying to raise up a leader by populist means. Anarchists and libertarians are now having to wake up to the real possibility that some of the more liberatory gains in the West since the 1960s will actually be reversed, in the USA for sure (especially for people of colour who may have expected more from the Obama time in office) and probably coming to Britain soon as Brexit gives the space for some of our establishment right-wing to try and roll back human rights here. On the other hand the politics of gender and colour have been a core feature of anarchist movement politics for at least a decade, with an explosion of gender related texts and zines, and non-English workers’ groups at bookfairs. Anti-colonialism has come to mean not only understanding the well-known structural legacy of the European empires (which has led to calls to remove the statues of Great Men from campuses and public places, for example), but it is also a wider recognition in our movement that class struggle cannot be analysed without a deeper conversation about the sources of internal and external dominance. This is not completely new of course as similar questions around ‘white skin privilege’ were around at the time of the dissolving of the Love & Rage Revolutionary Anarchist Federation in the 1990s USA, the same period as when Black Autonomy challenged a Euro-centric anarchist movement to do better. 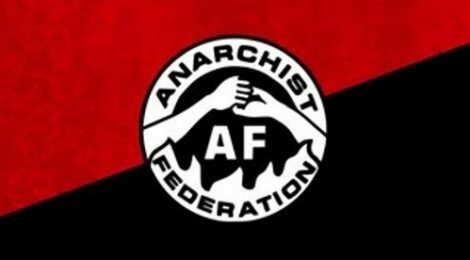 The AF has been a large part of recent developments, not least our co-organising of the AFEM 2014 international anarcha-feminist conference. However, the result of development of anti-colonial and even more inclusive thinking around colour and gender has clearly challenged the cohesiveness of the anarchist movement which, apart from small pockets of individualism that still exist, has all but adopted a social anarchist perspective in recent years. At this year’s bookfair the distribution of a leaflet against transgender rights (concerning an amendment to the Gender Recognition Act which would allow trans persons to more easily self-identify) was incendiary, being both pre-meditated by Trans Exclusionary Radical Feminists and pre-empted by a large number of bookfair attendees who choose to take direct action. For the AF (and the ACF before our name change) we are proud of our having made explicit the need for struggle against ‘other’ oppressions and independent organisation by oppressed minorities as a core principle of a class struggle organisation since our inception 31 years ago, and this has become more concrete in recent years by inclusion of caucuses (for Gender-oppressed, LGBTQ and most recently for members who have disabilities or mental health problems), a safer spaces policy and production of a text on Privilege Theory. However, differing responses to the bookfair events, and a few years of tension preceding this within AF, has led to 12 of our membership (including all of our remaining founder members) leaving on the grounds that this has gone too far – it being diversionary from the class struggle, merely identity politics being expressed as inward looking sub-cultural disputes, whilst the majority of us who strongly disagree with that view are having to regroup in 2018 to consider the consequences for the AF and our movement (seeing as the Bookfair won’t happen, with the 2017 collective having resigned). Gender politics will be a big part of this, as no doubt will be a more nuanced anti-colonial thinking. Whilst the last paragraph may leave you thinking we may, after all, be overly self-obsessed, considering the grimness of the world as outlined in the earlier ones and seeming inability of our movement to have much of an impact on it, we are now in a position to move forward more effectively. In 2017 we published one issue of our paper Resistance focussing on housing after the Grenfell fire and practical work by tenants groups, benefits fightback and anti-fracking protests, also looking at organising within the gig economy, another common feature of working class existence in the UK. Our two issues of Organise! magazine tackled prisons and international solidarity in the first and the meaning of revolution in the second. We have been part of making regional bookfairs happen and have engaged in political campaigns where we live. We are committed to a revolution where liberation benefits all. As a key aspect of this commitment we are seeing that the structural barriers to liberation from history are plainer than ever, having witnessed how the authoritarian right (and left) have been acting with increased confidence over the last year. We would be pleased to work with others in the social anarchist and libertarian anti-capitalist movement, to develop ideas and make a real difference together.